ESI Deposition Question Outline Checklists, Litigation Hold Letters, and Usable e-Evidence Techniques. Experience more ways to make your electronic document discovery and litigation easier. Now you can save hours of time. Use available superior litigation hold letters, deposition outlines and trial questions checklist forms, and mentoring tips involving electronically stored data. E-discovery is easier and better if you start with forms developed by LawyerTrialForms™. Deposition outline checklists, litigation hold preservation letters, and usable e-evidence tips for electronic data discovery preparation, depositions, and e-evidence in litigation, and more. Battle-tested tips, forms, and ESI (electronically stored information) e-discovery / e-data tools. Experience even more ways to make ESI litigation easier. Immediate forensic imaging of computers may be your best money-saving and the best spoliation-prevention option. Use this form to get imaging of ESI at the start of litigation. You gain a “frozen image” in the hands of an expert who can testify to foundation and chain of custody to the evidence you later find and use from that image. This protocol works whether you are doing the imaging by agreement of the parties, by court order over the objections of the adversary, or by your own directions to your own expert. 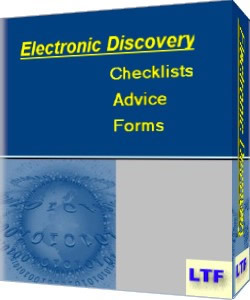 The forms, checklists, and outlines in this section of the product catalog involve issues of electronic evidence in discovery, litigation, settlement, and trial. The deposition checklists are outlines of questions. The other legal forms in this section are designed as not only checklists of items to do or include, they also serve as mentoring devices in this e-data, e-discovery, e-evidence age. Our vision statement is: “Making Good Lawyers Better”. The publisher, editor, and author of the form or article you purchase do not render legal or other professional services. If legal advice is sought, see a lawyer in your own state.